Scottsdale itself is a truly great town to be in. There is a fantastic atmosphere in the shopping district, the people are friendly, the facilities modern and varied, and the scenery spectacular. Bridport is the holiday destination of many Scottsdale residents. A thriving little town, especially in summer, a great deal of the buildings are holiday houses. The beaches are delightful, the wildflower reserve beautiful, the fish is truly fresh and the feel is relaxed. Derby (below) is a fascinating little town, full of history. A former tin-mining boom town, its past is remembered at the popular Derby Tin-Mine museum, with a full replica working village that will interest for hours. There are some great little shops featuring arts, crafts and antiques. More hop fields, here, plus sawmills and some lush, green farms. 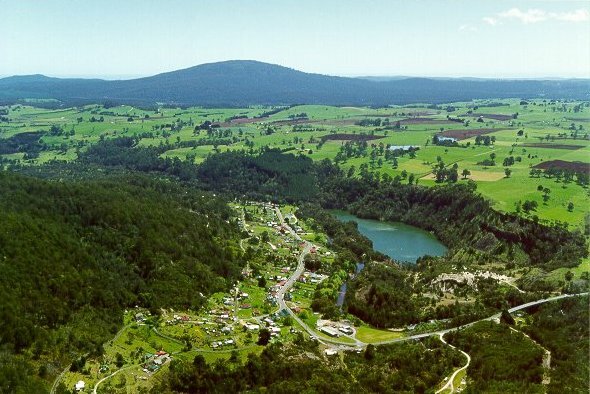 This is real dairy country, Ledgerwood being the home of the United Milk Tasmania butter factory. Ringarooma is the last stop before Mt Victoria, where there is some great bushwalking to be had, as well as Ralph Falls, where there is a short bushwalk with spectacular views over the valley and the sheer drop of the waterfall. Both these settlements have links with the past, in that they were both populous homes of Chinese miners. This is evident when one visits the fascinating cemetries that are in these towns. 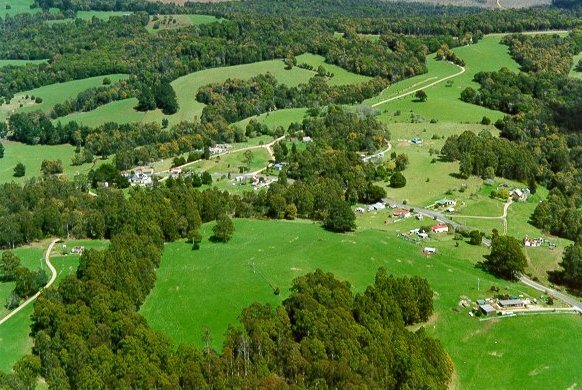 The main feature of Moorina is its lovely golf course set in the bushland, and of Weldborough (below) is the guided, true cool-climate rainforest walk on the Weldborough Pass about ten minutes south of the township. The home of the famous "Pub in the Paddock," with the beer-drinking pig. 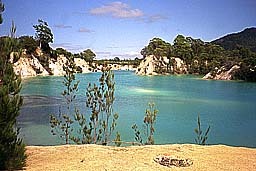 Also in this community is Healy's cheese factory, (a must-taste) and Tasmania's tallest waterfall, the St Columba Falls.